Snow and packed ice on sidewalks lingers on after this week’s storm, and business owners on Route 6 and residents are complaining about it. Mayor Ellen Zoppo-Sassu said City Hall gets complaints, and she hears them on her police radio, about icy sidewalks. Zoppo-Sassu stated that homeowners and business owners have 12 hours from the conclusion of a storm to clear their sidewalks to make them passable. “On behalf of our neighbors and friends who rely on your cooperation in this important matter…thank you!” the commission concluded. The police department’s non-emergency number is 860-584-3011. 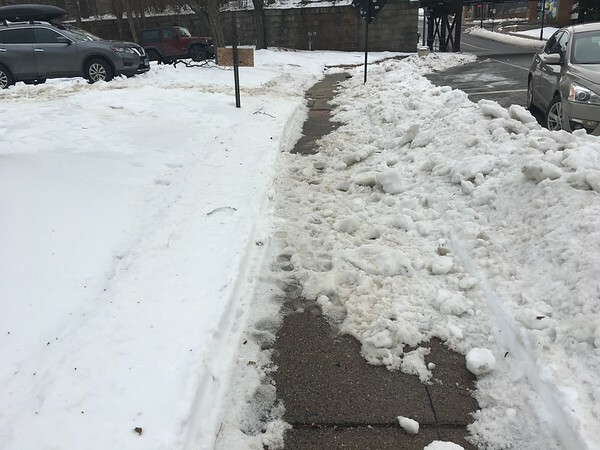 In Plainville, Superintendent of Roadways Dominick Moschini, said Wednesday that sidewalks are still “an absolute mess.” He urged residents to be cautious. Plymouth Director of Public Works Charles J. Wiegert said that the cleanup is still going. Posted in The Bristol Press, Bristol, General News, Plainville, Plymouth, Southington Herald, Terryville on Wednesday, 23 January 2019 20:28. Updated: Wednesday, 23 January 2019 20:31.